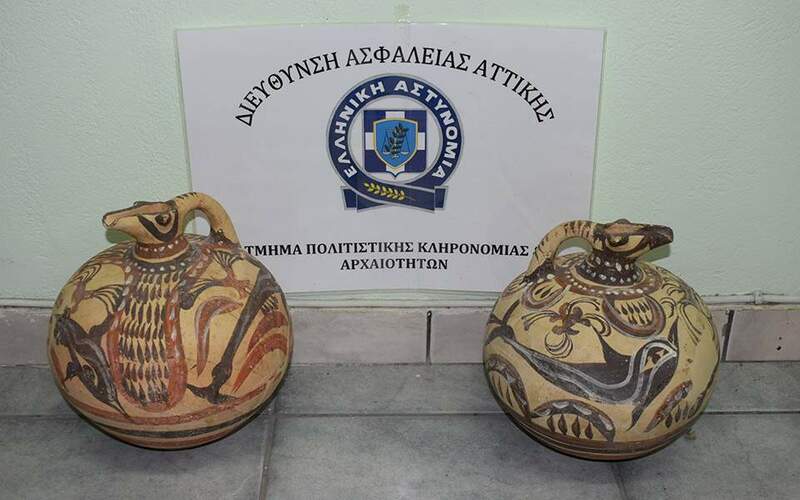 A night guard at the Archaeological Museum of Santorini has allegedly been caught in possession of several items that were stolen from the museum he was supposed to be guarding, the Culture Ministry confirmed on Sunday. According to the ANA-MPA news agency, authorities said they found the man in possession of 15 clay pots dating to the 17th century BC that had been discovered at the prehistoric settlement of Akrotiri, as well as three figurines (two stone and one clay) and a crystal glass object from the Sanctuary of Aphrodite in Ancient Thera, among other valuable artifacts. A second person has been arrested in connection with the same case, according to the police, but no details have been released regarding his or her identity or role. An investigation into the suspects’ activities is under way, though the police said that they are believed to have been active for at least a year, stealing valuable objects from the museum’s collection that are not on display and selling them on the illegal antiquities market.